When we first brought Willy home from the hospital, the first few days that followed were crazy. And by crazy I mean I think I’ve kinda blocked them out. It was definitely a period of all the feels. It hadn’t set in that he was ours and finally here. We were in awe and constantly in a watchful state: checking in on him to make sure he was comfortable, checking in on him to make sure he wasn’t hungry or too warm, checking in on him to make sure he was, ya know, breathing. We didn’t really have a game plan other than to keep him happy. The absolute last thing we thought about was anything that didn’t involve said baby. We had a freezer full of meals that I had prepared the weeks leading up to this event and I still think I ate crackers and cheese for a solid three days. If it wasn’t right in front of my face when I opened the fridge, it wasn’t happening. I didn’t think of my stomach (other than of course my annoyance that it was still a pudgy mess) until it was full on hangy. After the three days of the cheese and cracker diet, people started visiting and bringing meals. Meals that were ready to eat and delicious. They were a godsend. My mother-in-law introduced me to this salad. 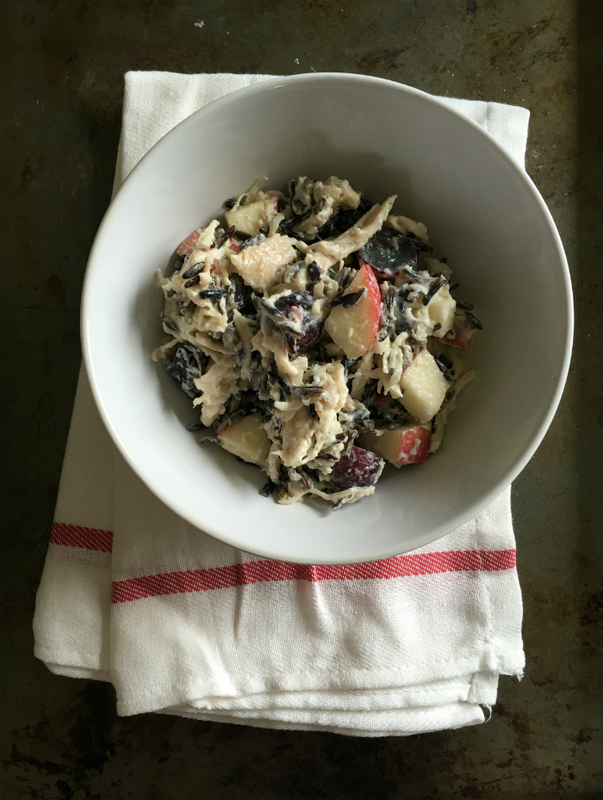 It was perfect because it required zero cook time on my end and I could pick at it all day in between feedings and the spare moments of sleep and not feel like a cow, but the chicken and wild rice were still substantial and healthy. It it has been made many times since and is my go-to when someone needs a meal. It’s also great on a (insert life event) shower menu or a make ahead meal for a week’s worth of lunches (it keeps well). 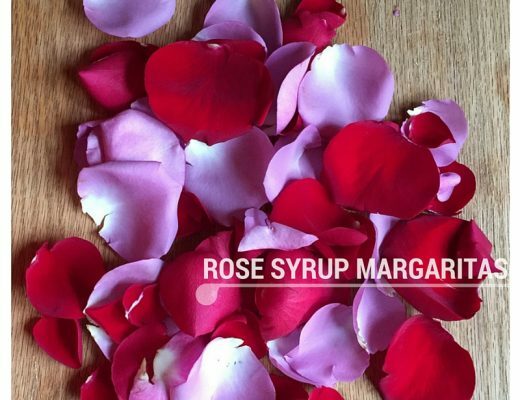 This is less of a recipe and more of a here-are-the-ingredients-just-throw-them-together kind of thing. The contents are simple and can be interchanged with anything you have on hand. Blanched asparagus or edamame would be a yummy addition to up the veggie count for the day. 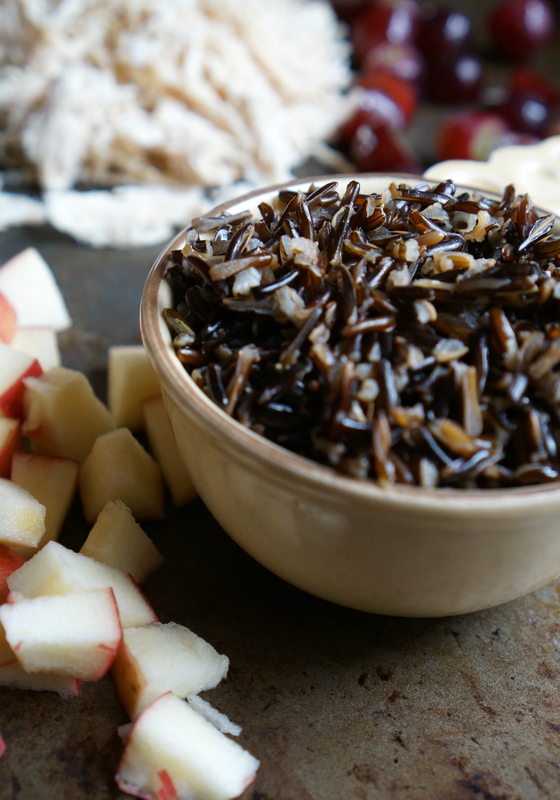 The featured ingredient, wild rice, adds a nutty crunch and pairs well with the sweetness of the grapes and apples. One ingredient I wouldn’t interchange is the olive oil mayo. It’s lighter than regular mayo and the fresh taste surprisingly makes a huge difference. *Again, I didn’t really measure, but I usually plan for one cup of wild rice for every chicken breast for each person served. The rest is up to you! 2. Season the chicken with salt and pepper and cook however you usually cook chicken. To make it extra easy to shred later, I put all my chicken breasts on the stove top with just enough chicken stock to cover the meat. I then bring to a boil and let simmer until chicken is no longer pink. Make sure to watch and ensure there is always plenty of liquid in your pan. 3. 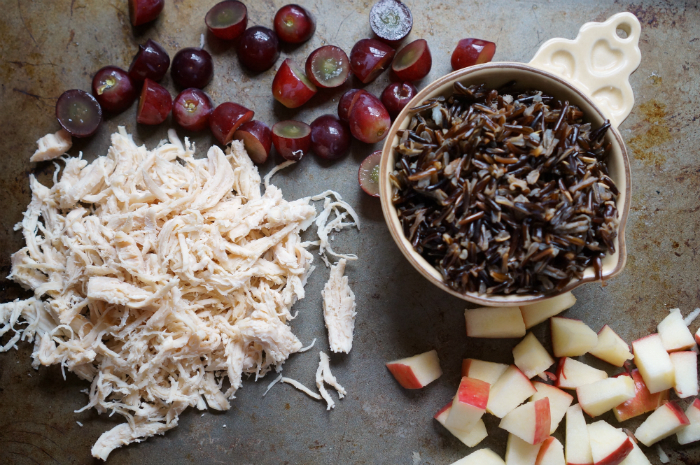 Shred chicken using two forks, Dice your grapes, apples, onions, and any other add ins. 5. Finish it off with a squeeze of lemon and a dash of salt and pepper. 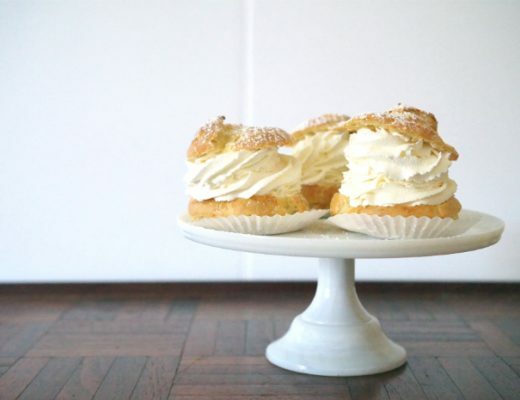 For leftovers, you may need to add a little more mayo if it dries out. 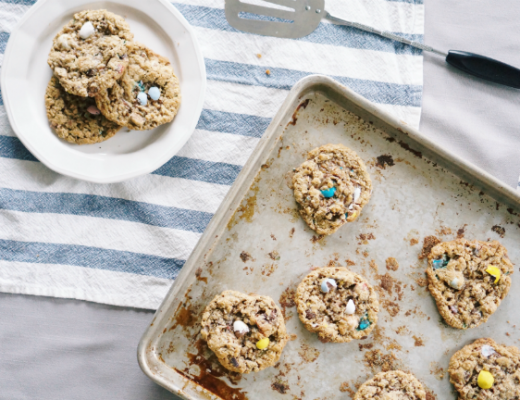 What’s your go-to recipe to bring to a friend in need?